In terms of population, Leeds is one of the top five cities in England with 784,846 residents in 2017 (according to Leeds Observatory figures). But the wider Leeds City Region stretching out into the West Yorkshire area has a population of 3 million. That means Leeds is at the heart of one of the largest urban areas outside London, alongside the West Midlands and Greater Manchester. Leeds is big in economic terms too: Invest Leeds City Region say that the economy of the area is worth £66.5 billion. They add that it generates 5% of all UK economic output and has a larger economy than nine European countries. This one-time northern industrial city has gone professional in recent decades. The banking and finance industry here is said to be second in size only to London, and it is also one of the largest UK centres for the law. Other key industries are precision manufacturing, food and drink, retail and healthcare – the Leeds Teaching Hospitals NHS Trust employs 14,000 doctors, nurses and other staff. A surprise rising star is the airline and package holiday company Jet2 which has its HQ here. Jet2 was recently reported to be the world’s third fastest growing airline by passenger numbers. The digital, media and creative industries are also very significant new industries. Leeds recently won the contest to become Channel 4’s new regional headquarters and it is anticipated this will encourage more digital and media companies to locate here. Leeds is also a massive student city with two large and three small universities with 65,000 students overall (according to Save The Student). It’s especially popular with students from South East England looking for a low-cost place to study. According to the Centre for Cities Leeds is a ‘brain gain city’ as more Leeds students stay on and get jobs here after graduation than anywhere else but London and Manchester. Leeds city centre is one of the UK’s biggest retail centres offering every high street store plus elegant Victorian shopping arcades with their high-end designer shops The massive Trinity Leeds shopping centre opened in 2013 and now attracts 23m visitors a year. The more upmarket Victoria Quarter opened in 2016 and features a new John Lewis store – regarded by many as a sign of a city on the up. Like many cities, the centre is becoming a hotspot for casual dining and leisure with new venues – everything from chain restaurants to quirky independent bars and eateries – opening almost weekly. One way to describe property values in Leeds would probably be ‘strong and stable’. Unlike in, say, London, prices don’t skyrocket in a boom but neither do they crash in a slump. The latest figures from Hometrack say that Leeds property prices have risen 32.7% on average since the financial crisis. A reasonable gain – although property values rose around 85% in London over the same period. Again, according to the Hometrack research, the average house price in Leeds is now £164,500 – a 3.6% rise over the last year. It means that investors can buy almost three average houses in Leeds for the price of one average house (currently £479,800) in London! Averages can be misleading of course. Look on property portals like Rightmove and Zoopla and you’ll find Leeds property prices start from around £50,000. A budget of £100,000-£150,000 will buy you a buy to let property in all but the most expensive areas. As in many other cities, rental demand in Leeds is brisk. A 2018 report in the regional daily newspaper the Yorkshire Post, quoting research by consultancy JLL, says that alongside other regional cities Leeds is a market to watch for rental growth over the next five years. It says that city living has gained strong momentum over the past three years and, together with an active student market, has pushed demand in both the sales and lettings markets notably higher. The JLL report predicts average rental value growth of 3.5% per year over the next five years and adds: This forecast makes Leeds city centre our standout market to watch for rental growth between 2018 and 2022. Another report in the Independent newspaper says that rents are growing several times faster in Leeds (as well as Birmingham and Manchester) than they are in London as a ‘millennial exodus’ from the capital boosts demand elsewhere. They say that rents rose 2.5% in Leeds over the last year. When it comes to choosing a place to invest in property Leeds is a really diverse location offering opportunities for all kinds of property investment. As well as city centre apartments and inner-city terraces for which the north is famous there are also large suburban housing estates and even some areas that are quite rural in nature. Here we’ll run through some of the most interesting areas for buy to let in Leeds. City living has boomed in recent years as young professionals together with more students have been attracted to live in the city centre. As well as converted warehouses there are lots of new build blocks. Leeds could take on more of a high rise city feel in future, as several 20-30 storey office and residential blocks are in the planning pipeline. If you’re interested in investing in Leeds city centre keep an eye out for the South Bank Scheme which is due to get underway within the next few years. This is an ambitious scheme (at 185ha said to be one of Europe’s largest) to extend the city centre south of the River Aire. The plans include offices, shops, a public park and 4,000 new homes close to the upcoming HS2 station. Investors can expect a steady 5% yield from a Leeds city centre (LS1 postcode) apartment, let to professionals. 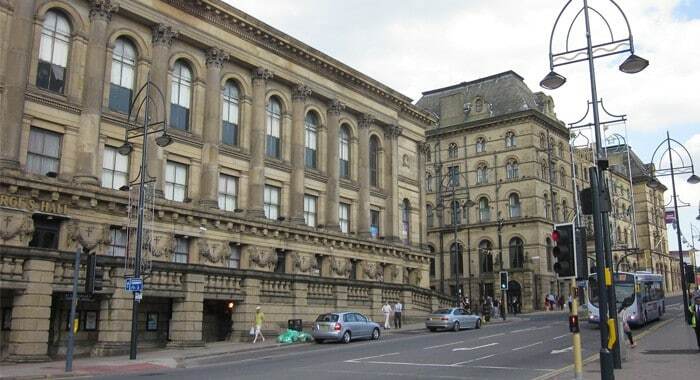 Just to the north of the city centre Headingley is thought of as Leeds’ ‘student central’. While it’s still popular with students – Leeds Beckett University has a large campus here – it has become more popular with professionals and families in recent years. Little wonder it is popular for renting as it has good schools, its own shopping centre plus a bus into Leeds centre around every 7 minutes making it very convenient for commuters. Strong demand for student lettings and professional lettings in Headingley means that buy to let landlords can make attractive yields of 7.4%. These inner city suburbs, between Headingley and the city centre, have become Leeds’ new student hotspot in recent years and many students have relocated here as rents are cheaper and the city centre university campuses are walkable. There’s also a demand from staff working at Leeds General Infirmary or LGI, nearby. All these locations offer good opportunities for investors, particularly those who are interested in offering house shares or HMOs. The current average asking price in these areas (mainly LS2 and LS3 postcodes) is higher than the Leeds average but it reflects the demand for student buy to let – and the demand from affluent parents buying property for their student offspring to live in. Yields are a minimum of 5-6% although with careful buying a good student investment property could return 9-10% or more. The main South Leeds suburbs of Armley, Hunslet and Beeston are areas of mostly terraced housing built in the days when this was the heavy industrial heartland of Leeds. All these areas have Leeds’ lowest property prices and they’re very popular with buy to let investors on a budget. One point to be aware of if you’re investing here is that Leeds City Council is planning to introduce a selective licensing scheme in Beeston (plus Harehills to the north of the centre) this year. This could make things more complicated for landlords here. But it could also reduce the supply of rental property, push up rents and in the process actually make the areas more profitable for landlords. Yields of 5-6% are about average across this area with Armley, potentially offering more due to it having some of the lowest house prices in Leeds. The North Leeds suburbs – including places like Roundhay, Moortown, Alwoodley, Adel and Horsforth – are Leeds’ smartest residential areas. The market here is supported by easy access to the city centre, easy access to Yorkshire’s wide open spaces plus very highly rated schools like The Grammar School at Leeds. All this means that north Leeds is the city’s most expensive area for a property – a family house will cost anything from £250,000 up to £1 million plus – so yields for landlords are tight. Average yields in these areas are about 3% although Horsforth (LS18) yields are just 2.24% – which Totally Money say is amongst their ‘top 10’ lowest yields in the country. Better value can be had in the up-and-coming areas that fringe the most sought after spots. For example, Oakwood, Meanwood and Kirkstall. A new railway station opened at Kirkstall Forge in 2016 offering a 9-minute journey into the city centre and lots of new houses are being built here. The north-eastern suburb of Crossgates and the nearby separate town of Garforth are good value, mid-priced property areas. They both benefit from railway stations offering easy access into Leeds and are close by the M1 making them attractive to commuters. They’re both especially popular for family buy to lets. If you’re interested in investing in North East Leeds you need to know about the East Leeds Orbital Road or ELOR project – which will make this very much an area of Leeds to watch. Once completed next year ELOR will open up access from M1 J46 to a huge area of rural land where 5,000 new houses are planned. The Thorpe Park business park at J46 is being expanded with new commercial properties and a retail park. A new railway station (East Leeds Parkway) and park and ride site are planned here, too. Investors could expect a steady 5% yield across this area. Other areas of Leeds that investors might consider include Pudsey (population 25,000) and Farsley (population 22,500) in West Leeds. They both offer good value property and are popular for family buy to lets. To the south west of Leeds, Morley (population 43,300) is a small town in its own right. Again, Morley has good value property. It also benefits from easy access to the M62 while a number of large business parks and the large White Rose Shopping Centre provide lots of jobs. Current average asking prices are £220,947 in Farsley (LS12) and £229,452 in Pudsey (LS28), with yields being in the 4-5% region. The average price in Morley (LS27) is £200,884 which means that a higher 5-6% yield is likely. Note. Population estimates are based on ward population figures from the Leeds Observatory which are based on ONS (Office of National Statistics) small area population estimates, except where indicated. Current average asking prices are taken from Zoopla and buy to let yields by postcode are taken from Totally Money Buy-to-Let Rental Yield Map 2018/2019.